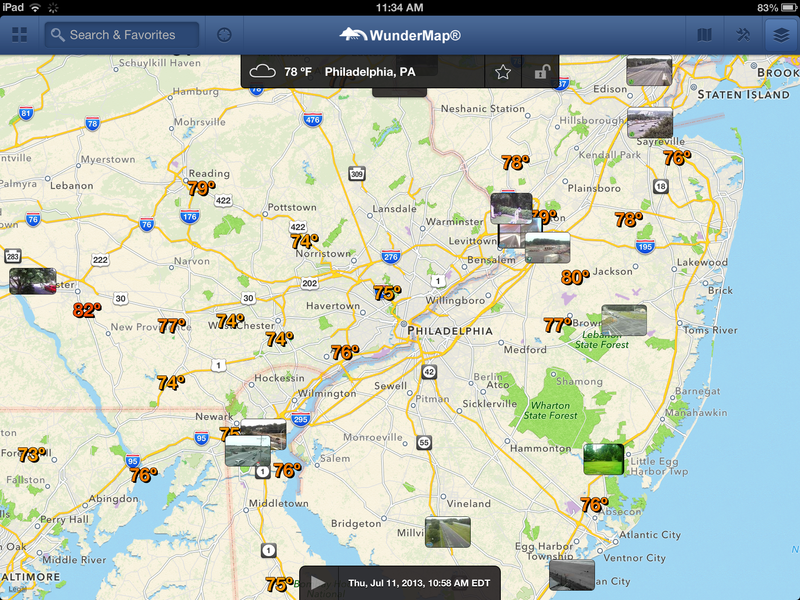 Weather Underground, the original online weather service, has relaunched its WunderMap weather app for the iPad(s AAPL) and Android(s GOOG) tablets. And with that relaunch comes more of the map layers that users of the website are used to, making the tablet app a whole lot more useful. The new WunderMap release, which appeared in the iOS App Store and Google Play Store Thursday morning, plays more nicely with a tablet’s large touch screen and makes it easier to swipe around a map and search for locations to explore temperatures, radar views of rain and various severe weather threats. With the new release comes eight different map layers that can be toggled on and off. The layers include weather stations, radar, satellite view, severe weather alerts, hurricanes, active fires, fire risk, and the service’s extensive network of webcams. They’ll appear on whatever area of the map you’re looking at. WeatherUnderground says it has more 30,000 webcams hooked up to its service. If you toggle this map layer on, miniature video screens will populate the map where they’re available. Tap one and the video will enlarge so you can, for example, see what the weather’s like up in the mountains or what the waves look like at the beach, along with the camera’s exact location. There’s also some neat customization options. There are 13 map presets. Click on the Hurricane preset and it will automatically take you to an active or projected hurricane; same goes for the Active Fires. The app is free to download, but if you’re not interested in looking at ads, an in-app purchase of $1.99 will take those away. How can I get the wunderground on my ipad to be like the good computer page and not the app?